Poong charcoal korean bbq restaurant is pretty unique in a way that it presents us with a traditional-styled restaurant. The decors were excessively ‘ordinary’ and everything was painted in green. There was no adequate exhaust fan for the smoke generated from the pot so I would advise you NOT to wear fancy outfit. Despite all these drawbacks, the restaurant caught my attention because of the hominess feeling and of course it is pretty cheap as you go with more people. Normally we go into the restaurant from the back entrance through an alley. There will be no a la carte menu in this restaurant and You will be cooking your own food on a burning-hot charcoal mesh. It is important to cook your food fast as it will be burnt pretty quickly if you are not aware. 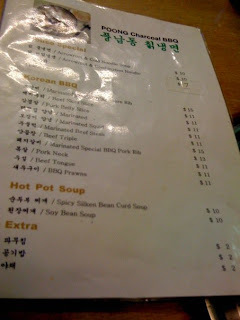 There’s not much variety of food they offer and their menu is presented in Korean with a loosely translated English (e.g. Beef triple, Beef Skirt Slice). 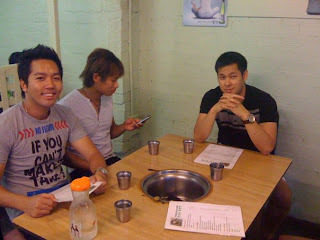 They do serve Korean Soju (rice wine) or Beer that you can try. 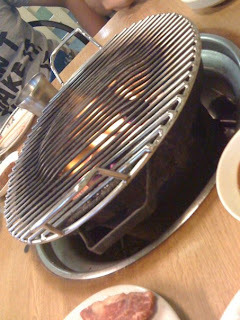 One must-order dish that I would recommend is Marinated BBQ Spare Ribs. You will get two layered, boned-in spare ribs that you can cut to your bite size. 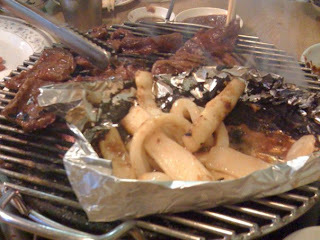 The meat is very juicy and a little bit BBQ-sweet. No matter how you cook it (from medium raw to well done), it will still be soft and tender. 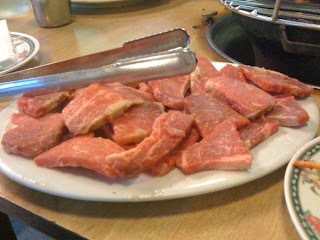 Once you’re done with the meat, I would also recommend you to cook the leftover bone for its tasty tendon. 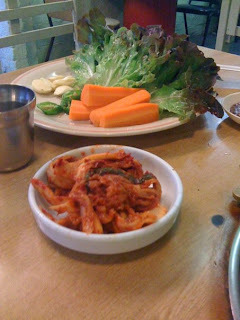 As a side dish, you will be given complimentary kimchi and a plate of assorted raw vegetables. 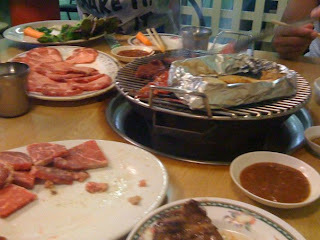 You will also be given sesame oil and homemade sauce – tastes a little bit hot and sour, like kimchi. The drink is served in an aluminium container/cup and there’s an additional charge for rice. For the daredevils, you are welcomed to try Poong’s authentic Korean cold noodle, called Arrowroot & Cold Noodle Soup. My not-so-much-of-a-fan illustration of this noodle would be: it’s grey noodle chucked into crushed ice with Kimchi sauce and some vegeteables. I’m pretty sure they like it a lot but it’s not suited to my tastebud. Parking space is available in nearby Canterbury RSL.